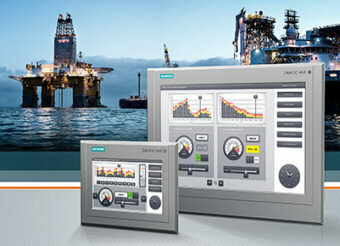 April 09, 2015 + + + Siemens has expanded its high-performance Comfort Panel class in the Simatic HMI (Human Machine Interface) series to include particularly rugged devices for use in extreme ambient conditions. The Simatic HMI TP700 and Simatic HMI TP1500 Comfort Outdoor Panels are equipped with a UV-protected device front with degree of protection IP65 and are ideally suited for use in refrigerated buildings, ships, or the oil and gas industry. The new devices can be used in a wide range of temperatures from minus 30 to plus 60 degrees Celsius and in up to 90 percent air humidity in nearly any environment and industry. The high-resolution and daylight-readable 7" or 15" widescreen displays with an aspect ratio of 16:9 and up to 16 million colors can also display complex process or plant images in a manageable, detailed manner. The high degree of glare reduction, wide reading angles, and automatic dimming allow for reliable and strain-free operator control and monitoring. This allows the user to reliably read data even when the weather changes or in changing light conditions. For the optimal use of space in the plant or for special machine designs, the panels can also be installed upright and operated in portrait mode. In the event of a power failure, the virtually maintenance-free Comfort Outdoor Panels ensure maximum data security by storing sufficient energy to exit all active archives without errors and to back up the data. Comprehensive certifications for use in hazardous areas according to Ex2/22, FM Class I Div. 2 or for shipbuilding applications are pending. The Touch Panels are integrated into the automation solution via Profinet and are configured using the Simatic WinCC engineering tool in the TIA Portal. The operating screens already developed for other Comfort Panels can be adopted with little effort and supplemented with the specifics for use outdoors. In addition, Siemens also provides a long service and support period of 22 years for these rugged devices.